TRUMBULL MANOR, Feb 20, 2014 at 9:00 p.m. to Feb 23 at 1:00 p.m.
We all seek happiness in family life, in our work, in socializing, in sports and in many other aspects of daily life. But we find that these things, good as they are, don’t bring us the complete happiness for which we long. We are built for more. Deep, lasting happiness and peace of soul come from encountering God and living in accordance with His will. We all need to take time out, to be quiet, to think about our life and our relationship with God - to go deep and have intimate conversations with Him. A relaxed, peaceful retreat will help us to do just that. This is not a luxury for a pious few but a necessity for each one of us. This retreat will be conducted by a priest of Opus Dei, a personal prelature of the Catholic Church, whose Founder, Saint Josemaria Escriva, was canonized by Blessed John Paul II in 2002. Our Executive Retreat is intended for established professionals, e.g. executives, attorneys, doctors and others with similar background and education. The retreat will begin at 9:00 p.m. on Thursday, February 20, 2014, and will end at 1:00 p.m. on Sunday, February 23, 2014. Trumbull Manor’s address is 50 Rica Vista, Novato CA 94947. 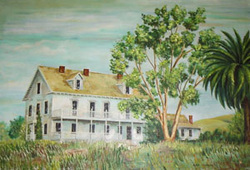 Trumbull Manor is located in northern Marin County, a forty-minute ride north of San Francisco. From 101, exit on DeLong Ave., right on Novato Blvd., left on Wilson, right on Center, right on Rica Vista.